← Running: Ew! Elephant Poo. So yesterday was the day; I was up a 6:00am and after completing my daily hygiene routine and suiting up for the run, I proceed down stairs to cook breakfast for my family who unlike me was still fast asleep in the warmth of their beds. If it were not summertime one would think this to be the beginning of a Christmas Story. Warming up the fry pan I prepared a meal of Eggs and Bacon…. BACON, Bacon Bacon Bacon! B A C ONNNN! Who doesn’t love bacon? I got to eat egg whites and turkey sausage because the bland is so much better then BACON! Once the morning meal was prepared I rousted the family, resisting the temptation of my inner drill sergeant, from their slumbers and OUT of the inviting warmth and comfort of their beds. We needed to be out of the house by 0730 in order to make the 0820 opening ceremonies at Liberty Station, a location where some 39 years earlier I was a young 17 year old in Navy boot camp. I was excited for this run; not because I was running in an event that is close to my heart, in support of military and their families, but because this would be the first 5K my loving ex-girlfriend and my 8 year old son had ever run and I was excited to see them succeed and to see that look of achievement we all felt after our first run. I’m still amazed how not wining can be so great and how the community supports each other no matter what; a support you find in few other sports. After colors and an opening ceremony that would tear at our heart strings they lined us up in waves; I chose to start our family in the 2nd wave since the 3rd and 4th waves seemed to have allot of people with strollers and such. 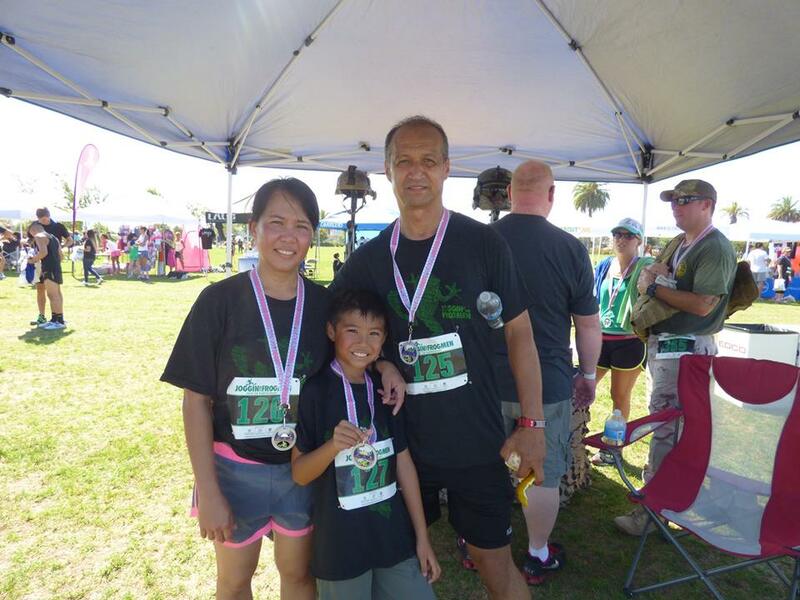 My wife (ex-girlfriend) and my son realized well into the first mile that it was HOT. 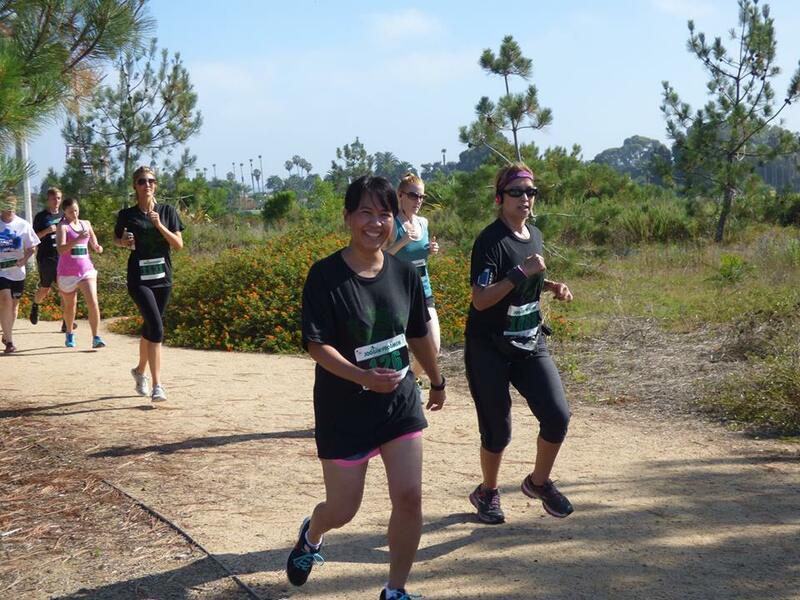 I don’t know why the event coordinator though it would be a good idea to start the race at 900am during the summer in San Diego; by 9 it was already 70 degrees with 83% humidity. My son was already flush, I luckily anticipated he would be overheating to I carried water for him. 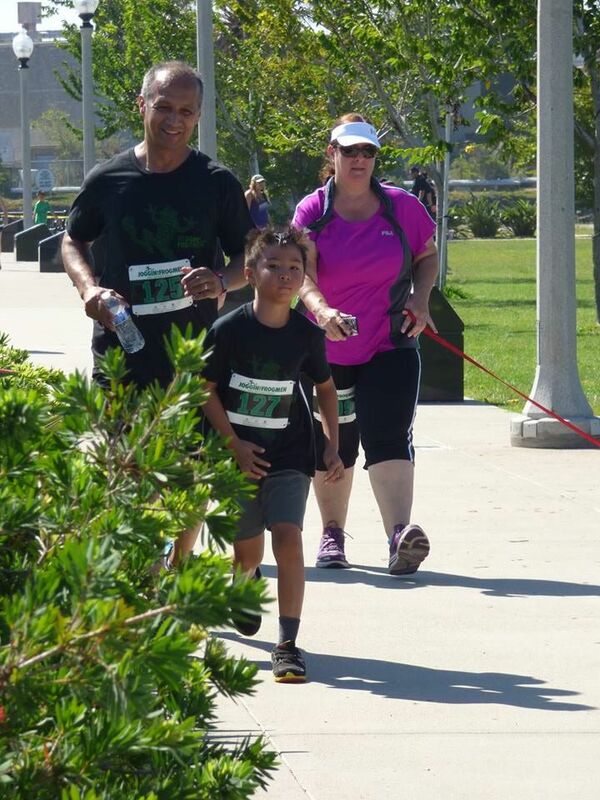 My ex-girlfriend broke ranks and ran ahead of us; Zeke, my little guy was petering out into the 2nd mile and walking, rather than running became the more prevalent mode of forward momentum. Although he was complaining I encouraged him to run when he could and motivated him as well as I could. Coming in to mile 3 he wanted to just lay down in the grass ‘for just a minute’ but he listened to me when I told him if he did that his muscles would get tight and it would be even harder to move forward again. At the last 50 yard from the finish line, even though he was tired, hot, and hurting he broke into a sprint and crossed the finish line in a full on run. I’m so proud of my ex-girlfriend and my son! They didn’t prepare for this run but finished it!!!!! Thank you to all of the runners and encouraged them to keep going and clapped and yelled for them when the crossed it finish line. This was by far my slowest run ever; but by far the best! 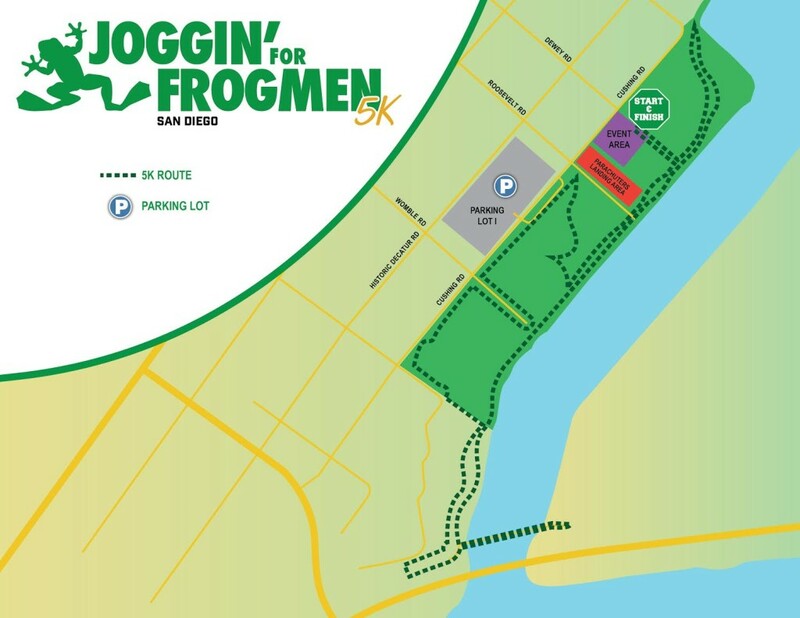 This entry was posted in Running and tagged 2015 San Diego Joggin' for Frogmen, 5K, California, Joggin' for FROGMEN, Liberty Station, run, running, San Diego, San Diego NTC. Bookmark the permalink. 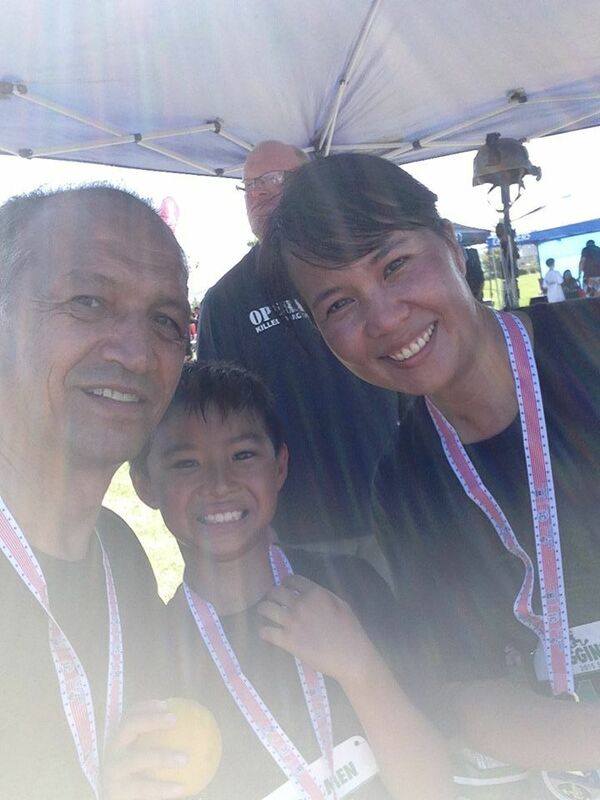 So awesome that you got to do something like this with your family. You must be a good motivator! You really do have a beautiful family. And you all are deservedly very proud and happy. I remember the first race D ran. Still chokes me up with so much love and pride! Thanks – it was a fantastic day I’m going to print one of the pictures and mount the medals and bibs and put it in the family room. Hopefully there are more family races to come ! Lovely! So much fun to do it with family. 🙂 One of my most memorable 5k’s is one that two of my younger brothers ran with me. Those are the best kind of memories!